Jad Abumrad. Photo by Marco Antonio. Jad Abumrad doesn’t do things by the book, and he’s been rewarded for it. He’s co-host and creator of “Radiolab,” a popular public radio show that’s broadcast on more than 500 stations across the United States and has been downloaded as a podcast over 9 million times per month. He’s a 2011 MacArthur “genius grant” fellow, and his radio program won the George Foster Peabody Award in 2010 and 2015. He’s working on a new podcast called “More Perfect” that explores how the decisions of the U.S. Supreme Court affect everyday people. Abumrad, 44, got his college degrees in creative writing and music composition from Oberlin College. After college, he wrote music for movies and crafted documentaries for local and national radio shows. 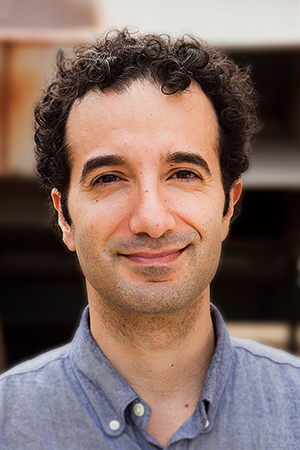 Abumrad will be the opening keynote speaker at the ISTE (International Society for Technology in Education) conference Sunday, June 25. THE Journal caught up with him to talk about his background, experiences and thoughts on education and technology. THE Journal: How did you get into public radio? 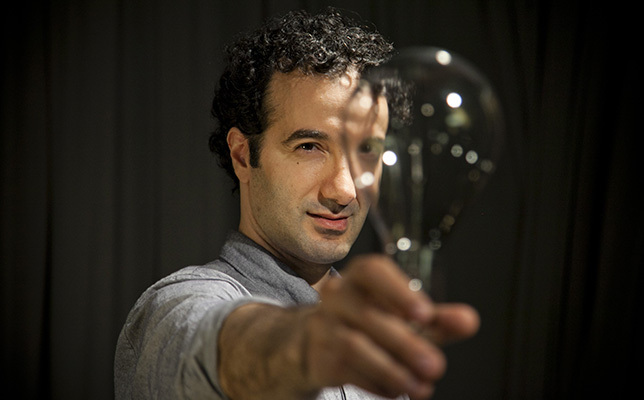 Jad Abumrad: I was a struggling musician and writer, and flailing at both. During my post-college flail, my girlfriend, who’s now my wife, suggested radio. I studied both writing and music. Radio is kind of both, but it’s neither. THE Journal: When and where was the first “Radiolab” show? How has it changed over the years? Abumrad: I would say early 2002 — January, February or March-ish. I had been working on a bunch of different shows. It sort of had a soft, fumbly beginning. It shifted and changed forms in the early beginning. The first time I did something, the actual thing people would call “Radiolab,” was 2005. It has evolved in a hundred different ways. Initially it was just a show that I loved making. But I had no time to have a plan. I just thought, “I have to fill three hours.” I didn’t have time to make a vision. It happened so quickly, then I had to do it. I didn’t expect it to catch on in public radio. Up until about six years ago, it was just, like literally, the only expectation I had was related to the story in front of us. It was super hand-to-mouth. We worked right up until the last second [before it aired]. THE Journal: What kind of effect did podcasts have on your show? Abumrad: Podcasting gave us a lease on life. In 2006, I think that’s when we did our first podcast. We were able to experiment with sound, with music. And that was an evolution I couldn’t have ever anticipated. “Radiolab” was not just a show — it became a signifier of a style and a way of doing things. I never expected that to happen. I never expected it to be about science. THE Journal: Describe the role of technology in your show. Abumrad: It’s a very digital show. It feels very organic and very inviting, for public radio. We came along at a time when things felt very analog. Technology is important because of the way it was influencing the sound. Before us, the edit was not a huge character. Things in public radio were meant to always sound conversational. We came along, and we just started using ProTools when people were still using tape and razor blades. We’d make pieces with 12 voices interwoven in one story. We took a very hi-fi music production digital approach to telling basic radio stories. At first, it was too much for people. It was too much, too fast. Technology initially allowed us to work at a level of density and speed that was unusual. We incorporated a lot of electro-acoustic sounds. We do a lot of esoteric sound synthesis — for instance, we’d sample a harmonica, then elongate the tail and make a 12-minute drone. You can adjust it up and down, and it sounds harmonica-y. It sounds kind of familiar — familiar sounds made strange. To create those noises, I’m not interested in a band. I’m not interested in dance music. I’m interested in some co-mingling of all of it. I do want there to be moments where you hear things you don’t expect to hear. Seductive, yet peculiar, yet weird. Now, as the technology evolves further, literally you can make an entire podcast on a laptop on a plane. We produce the show in different parts of the country now. Everyone gets on Google Hangouts and each person does the show from different locations with ISBN tools. It’s just kind of crazy. It’s amazing. THE Journal: How does what you do tie into the mission of ISTE? What are you going to talk about during your keynote speech? Abumrad: That’s a really good question. I’m planning to give a talk that tells the story of my journey in radio, and the story of “Radiolab” as it came into the world. It’s the story of a strange, non-linear meander. How does one learn and grow and develop in a situation where things are changing so quickly, so you don’t know what, in a given moment, what to do. My career is an example: How do you dance with doubt and navigate periods of uncertainty? Between that story, and how do you shape young minds when things are — when the ways in which we do that are so up for conversation, and up for grabs. I think that’s going to be where I sort of try and dwell. I’m not going to get too much into educational theory. I’m a proponent of methods of education where you let people struggle through things. Not rote education, but co-discovery. It’s not necessarily a new idea. I’m interested in those models of education, and I feel like I’m a product of one. I’m going to pull out a lot of different ideas — from poker to theoretical biology to music. They’ve been helpful to me in my own evolution. THE Journal: We grew up in a time without the internet. Now almost every kid has easy access to it. Do you think technology has fundamentally changed education? Abumrad: Oh yeah. The answer has got to be yes. Has it made it better or worse? I don’t know. But absolutely it has changed education. I came of age in that generation that grew up without the internet, half with the internet, half without. It’s changed every aspect of my life. It’s had to have had a major effect on learning and on teaching. I’m never quite sure whether it’s a good thing or bad thing. THE Journal: Some people like Nicholas Carr, the author of “The Shallows: What the Internet is Doing to Our Brains,” argue that the internet is affecting our and our children’s ability to focus, to concentrate and to think deeply. Thoughts? Abumrad: There’s a discipline that’s been lost, a focus that’s been lost. Things have gotten more noisy. On a more casual level, we accept things that might not be true, that [previous generations] might not have accepted. But the internet does give us flexibility. We are able to make connections, and engage in horizontal thinking — that seems like a good thing. We can draw connections across disciplines and cross boundaries that were very hard for us before. The jury still out. I do wonder as a teacher what it’s like to be so present in learning now. THE Journal: You won the MacArthur Fellow grant in 2011. Has that changed your life? Abumrad: Yeah it has. It didn’t change it in a very, very concrete way. The money was amazing, and it came during a time when I really needed it. But it’s a certain amount of money every year, and heavily taxed. But it gave me a thing I could think about when I’m really lost. “Don’t despair” — it gave me a little bit of confidence. It allowed me to have conversations with people I wouldn’t have otherwise. It’s a door opener for sure. THE Journal: Does being Lebanese American give you a different perspective on things? Abumrad: I think so. Only in that — I grew up in the South, in Tennessee, at a time when being anything other than a white person was weird. I grew up in this Southern Baptist universe. You’re not part of the dominant culture — that just shapes you in all these ways. Then in Lebanon, I was the American kid. So you’re in between. I’ve learned this is the perfect place to be as a journalist. As a journalist, you’re always in between. That just felt very comfortable to me. My Lebanese American-ness has given me a certain attitude most of my life. Christian Arabs assumed I was Muslim. People don’t know what the [expletive] they’re talking about, when they’re talking about the Middle East. It’s a very un-homogeneous place. People don’t get along there, and they’re not alike. The Shia are different from the Sunnis, who are different from the Druze and the Greek Orthodox. It gives you a healthy respect for how complicated stuff is, and how they don’t boil down to simple explanations. THE Journal: For a long time, public radio has been a homogeneous place. Has it diversified? Abumrad: A bit. Not enough. They’re trying. I can only really speak with authority about my radio station, WNYC, where they’ve made diversity a real important goal. It’s a real priority for them. It’s happening. But it’s happening slowly. I don’t know if we as a system have done much as we can. It’s still predominantly white. [What has been done] is not nearly enough.